Intelligent assistance embedded consumer devices are artificial intelligence (AI)-powered voice-based assistants. The intelligent assistance embedded device can perform services or tasks based on verbal commands. Virtual assistance is expanding rapidly, with new products entering the market and a strong emphasis on voice user interfaces. Further, embedded intelligence helps in analyzing a product’s working environment to enhance and control the overall product performance. This capability of the device unleashes new opportunities to increase quality or to ensure better customer satisfaction by enabling accurate work with greater efficiency than humans. Emerging technologies such as intelligent-embedded assistant devices and echo dot personal assistants are used for entertainment. These technologies have led to a new world of possibilities and opportunities. Smart Home is one of the focus areas in which intelligent assistant embedded device technologies are being integrated and this is the key factor propelling the growth of the market. Increasing number of third-party vendors and a developer environment for intelligent assistance embedded devices is escalating the market. Intelligent assistance embedded technology is used in numerous devices such as smart TVs, smart speakers, video surveillance devices, and others. Rise in adoption of connectivity technology is high in the market as most manufacturers provide smart interactive systems for connectivity and offer remote access services to different devices at different locations. Assisting software and devices are providing voice control device services for connectivity. Meanwhile, an increase in the use of virtual assistance platforms and adoption of smart devices are expected to boost the market. The intelligent assistant-embedded consumer devices market has been segmented based on device type and region. According to the research, mobile devices are projected to see the highest implementation of intelligent embedded devices during the forecast period. Growth in usage of mobile devices is highest as compared to other products. Mobile devices hold major share in the market currently and the trend is expected to continue during the forecast period as well due to rapid growth in the number of mobile phone users. Furthermore, digital revolutions taking place in countries such as India, South Africa, and China also drive the adoption of mobile phones, thus driving the intelligent assistant-embedded consumer devices market. Furthermore, the governments of India and China have undertaken initiatives for smart city projects. This offers opportunities to increase the installation of smart devices such as voice control AI assistants, smart displays, and customer service devices to enhance the customer experience. In terms of volume, North America holds a strong position in the global Intelligent Assistant-Embedded Consumer Devices Market. This is due to strong adoption of these devices with the presence of many IT and software companies and electronics devices manufacturers in the region. Additionally, increased adoption of advanced technologies and increase in the number of mobile phone users are driving the market in this region. After North America, the market in Europe and Asia Pacific are expected to contribute considerable share due to rising number of IT companies. Asia Pacific is estimated to hold the highest growth rate in terms of CAGR during the forecast period as compared to North America and Europe. Although North America holds the largest share of the market, its growth rate is less compared to APAC. The market in MEA and South America are projected to grow at a slower pace during the forecast period. Major players in the intelligent assistance embedded devices market include Microsoft Corporation, Samsung Electronics Co. Ltd., Google, LLC, Apple Inc., Lenovo Group Ltd., LG Electronics, HP Development Company, L.P, Intel Corporation, ARM Holdings, and Amazon.com Inc. Major players in the market are investing significantly in developing systems equipped with latest technology and offer advanced functionality. To expand market presence across the globe, strategic partnerships and collaborations with regional vendors is a major strategy adopted by leading vendors of the market. The intelligent assistant-embedded consumer devices market report provides analysis for the period 2016–2026, wherein 2018 to 2026 is the forecast period and 2017 is the base year. The report covers all the major trends and technologies playing an influential role in the market’s growth over the forecast period. It also highlights the market dynamics, which comprise drivers, restraints, and opportunities, for the analysis of the market during the said period. The study provides a complete perspective on the evolution of the global intelligent assistant-embedded consumer devices market throughout the above mentioned forecast period in terms of revenue (Million Units). The market overview section of the report demonstrates market dynamics such as drivers, restraints, and opportunities that influence the current nature and future status of this market, besides the challenges of the market. In addition, market opportunity analysis has been provided for every segment in the report, in order to offer a thorough understanding of the overall scenario in the Intelligent Assistant-Embedded Consumer Devices Market. The report also provides an overview of various strategies adopted by key players present in the market. The report highlights the competitive landscape of the market, positioning all the major players according to their presence in different regions of the world, and initiated by them in the market. The comprehensive Intelligent Assistant-Embedded Consumer Devices Market estimates are the result of our in-depth secondary research, primary interviews, and in-house expert panel reviews. 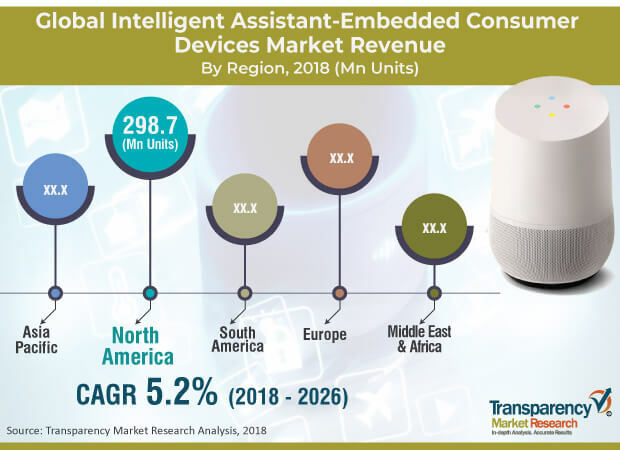 These market estimates have been analyzed by taking into account the impact of different political, social, economic, and technological factors along with the current market dynamics affecting the intelligent assistant-embedded consumer devices market growth. This report provides all the essential information required to understand the key developments in the intelligent assistant-embedded consumer devices market and growth trends of each segment and region. It includes companies’ strategies, business overview, business portfolio, and financial information, under the company profile section. This report also provides a comprehensive ecosystem analysis of the market. It explains the various participants, including software & platform vendors, system integrators, intermediaries, and end-users within the ecosystem of the market. The research methodology is a perfect combination of primary research, secondary research, and expert panel reviews. Secondary research sources such as annual reports, company websites, broker reports, financial reports, SEC filings and investor presentations, national government documents, internal and external proprietary databases, statistical databases, relevant patent and regulatory databases, market reports, government publications, statistical databases, World Bank database, and industry white papers are referred. Primary research involves telephonic interviews, e-mail interactions, and face-to-face interviews for detailed and unbiased reviews on the intelligent assistant-embedded consumer devices market, across geographies. Primary interviews are usually conducted on an ongoing basis with industry experts and participants in order to get latest market insights and validate the existing data and analysis. Primary interviews offer firsthand information on important factors such as market trends, Market Volume, competitive landscape, growth trends, outlook etc. These factors help to validate and strengthen secondary research findings and also help to develop the analysis team’s expertise and market understanding. Moreover, the data collected and analyzed from secondary and primary research is again discussed and examined by our expert panel. Major players in the embedded intelligent systems market include Microsoft Corporation, Samsung Electronics Co. Ltd., Google, LLC, Apple Inc., Lenovo Group Ltd., LG Electronics, HP Development Company, L.P, Intel Corporation, ARM Holdings, and Amazon.com Inc. Major players in the intelligent assistant-embedded consumer devices market are investing significantly in developing systems equipped with latest technology and offering advanced functionality. To expand market presence across the globe, strategic partnerships and collaborations with regional vendors is a major strategy adopted by leading vendors of the market.